A tide of tattoos, leather and thousands of thundering Harleys will surge into South Dakota this week for the Sturgis Motorcycle Rally, one of the largest biker gatherings in the world. The small town's population will grow more than sixtyfold as crowds of iron-horse lovers take in a week of open roads, flowing booze and hard living. The rally attracts more than its share of weekend warriors eager for a brief interlude of escapist revelry. But for thousands of members of the Hells Angels, the nation's most notorious motorcycle gang, it's not vacation; it's a way of life. Despite the group's fame and long history, there is much about the Angels that remains shrouded in mystery. The history of the gang and its current membership are murky topics, and what goes on inside its secretive clubhouses tends to stays there  just as the bikers want it. The Hells Angels Motorcycle Cub began in Fontana, Calif., in 1948, at a time when military surplus made motorcycles affordable and the placid postwar years left many veterans bored and itching for adventure. A vet named Otto Friedli is credited with starting the club after breaking from one of the earliest postwar motorcycle clubs, the Pissed Off Bastards, in the wake of a bitter feud with a rival gang. "Hell's Angels" was a popular moniker for bomber squadrons in World Wars I and II, as well as the title of a 1930 Howard Hughes film about the Royal Flying Corps (the phrase lost its apostrophe over time). For years, the HAMC, as members refer to the group, remained a California organization; the first chapter to open outside the state started in Auckland, New Zealand, in 1961. Eventually the club grew to most states and 30 or more countries, fueled by the alluring imagery of devil-may-care outlaws making their own rules. Pop culture helped buttress that iconic image, especially the 1954 Marlon Brando film The Wild One and Hunter S. Thompson's 1966 account of spending a year with the gang in northern California. The group says a typical member rides 20,000 miles a year, usually on the Angels' preferred machines, Harley-Davidsons. And members still refer to themselves as "one percenters"  a half-century-old boast playing off the saying that 1% of troublemakers give a bad name to 99% of respectable bikers. Still, the Angels insist the club's reputation as a criminal organization is undeserved, pointing to its frequent charity work on behalf of children and veterans. A banner on the bottom of the Hells Angels website reads, "When we do right nobody remembers, when we do wrong nobody forgets." Yet many Hells Angels have clearly lived up to their lawless image  arrests and convictions for drug trafficking (especially meth), assault, weapons possession and even murder have trailed the group for decades. Most notoriously, Hells Angels allegedly plotted to kill rock legend Mick Jagger following the infamous 1969 riot at California's Altamont Speedway, where the gang was providing security. The Rolling Stones front man had criticized the Angels after a biker stabbed to death a spectator who had pulled a gun during the melee; the killing was ruled self-defense and charges were dropped. (Much of the episode was captured in a 1970 documentary film about the Rolling Stones.) Overseas, a multiyear turf war across Scandinavia involving the Hells Angels in the 1990s reportedly included attacks with machine guns, rocket launchers and grenades and cost close to a dozen lives. More recently, three bikers were killed during a massive brawl between the Hells Angels and the rival Mongols gang at a Nevada casino in 2002. In 2007, a woman was found severely beaten at the door of the group's fortified headquarters in New York City's East Village; heavily armed police raided the building with helicopters hovering overhead, but no charges were immediately filed. As a result, authorities are accustomed to treating the Hells Angels with caution. SWAT teams have monitored Hells Angels' charity motorcycle rides in case trouble breaks out, and teams of police met the bikers in Minnesota as they traveled to Sturgis this summer in a show of force. As officer Steve Ovick told a local newspaper, "You don't poke a hornets' nest with a stick, but you sure do like to know where the hornets' nest is at." Hells Angels can be recognized by their leather or denim jackets featuring the red-and-white winged "death's head" logo, the letters HAMC and often the number 81  representing H, the eighth letter of the alphabet, and A, the first. 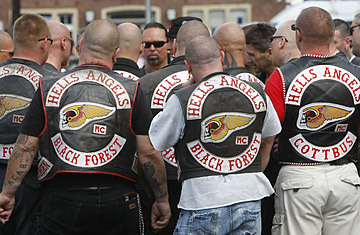 Like soldiers who don emblems on their military uniforms, Hells Angels wear a variety of patches on their jackets indicating their status in the group; the precise meaning is known only to fellow Angels (full-fledged Angels are known as full-patch). Members are known to one another only by their road names; a memorial page on the gang's website includes tributes to deceased bikers listed only as Triumph Viking and Fat Ray. As far as becoming a Hells Angel without putting in a whole lot of effort, good luck. The membership information on the web site essentially boils down to this: "If you have to ask the question, you probably won't understand the answer."